Calling all fitness enthusiasts and athletes. 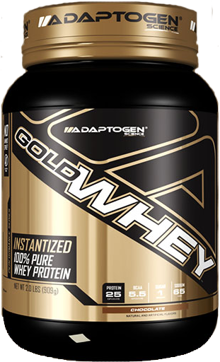 Adaptogen Science Gold Whey has been designed to fuel your toughest workouts and boost your recovery with 25 grams of the highest quality fast release protein with 5.5 grams BCAA and 4000 mg glutamine in each serving. Gold Whey is low in fat, carbohydrates, and sodium, making it the perfect whey protein for those wanting to lose fat and/or build muscle. Plus, Gold Whey is instantized to ensure seamless mix-ability with your favorite beverage. 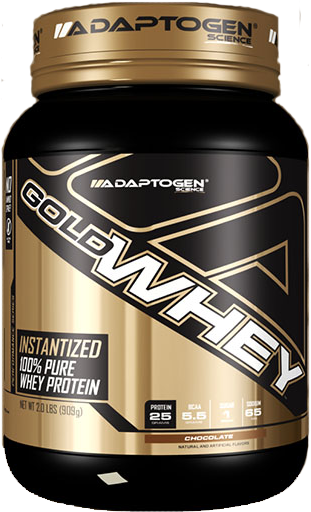 Gold Whey is a 100% whey protein powder that uses state of the art Cold Processed Technology combining three of the best proteins available – Whey Protein Isolate, Whey Protein Concentrate, and Whey Protein Hydrolyzed. Whey protein has been suggested to stimulate postprandial muscle protein accretion and enhance protein synthesis, resulting in more significant muscle growth. If you’re ready to see some real results, you’re ready for Gold Whey. Whey protein is the athlete’s ideal protein source, delivering all the essential amino acids the body needs to enhance the muscle-building results of exercise and promote intensified strength. Feed your muscles exactly what they need exactly when they need it in a tasty, easy-to-mix shakes formulated specifically for athletes like you. Gold Whey has quickly set the new standard in protein powder with a quality formula that can satisfy your protein needs any time of day. Pennings B, et al. Whey Protein Stimulates Postprandial Muscle Protein Accretion More Effectively than do Casein and Casein Hydrolysate in Older Men. The American Journal of Clinical Nutrition. 93:5. (2011): 997-1005. Tipton KD, et al. Stimulation of Net Muscle Protein Synthesis by Whey Protein Before and After Exercise. American Journal of Physiology: Endocrinology and Metabolism. 292:1. (2007): 71-76. Hulmi JJ, Lockwood CM, Stout JR. Effect of Protein/Essential Amino Acids and Resistance Training on Skeletal Muscle Hypertrophy: A Case for Whey Protein. Nutrition & Metabolism. 7:51. (2010). Tang JE, et al. Minimal Whey Protein with Carbohydrate Stimulates Muscle Protein Synthesis Following Resistance Exercise in Trained Young Men. Applied Physiology, Nutrition, and Metabolism. 32:6. (2007): 1132-1138. Hayes A, Cribb PJ. Effect of Whey Protein Isolate on Strength, Body Composition, and Muscle Hypertrophy During Resistance Training. Current Opinion in Clinical Nutrition & Metabolic Care. 11:1. (2008): 40-44.